The Republic of Trinidad and Tobago is an archipelagic state in the southern Caribbean, lying northeast of the South American nation of Venezuela and south of Grenada in the Lesser Antilles. It also shares maritime boundaries with Barbados to the northeast and Guyana to the southeast. The country covers an area of 5,128 square kilometres (1,979 sq mi) and consists of two main islands, Trinidad and Tobago, and 21 smaller islands. Trinidad is the larger and more populous of the main islands; Tobago is much smaller, comprising about 6% of the total area and 4% of the population. Originally settled by Amerindians of South American origin at least 7,000 years ago, Trinidad and Tobago was occupied by Arawakan- and Cariban-speaking peoples at the time of European contact in 1498. A history of slavery and indentureship has left the country with a mixture of African, Indian, mixed-race, European, Middle Eastern and Chinese people. All these groups have left an imprint on the national culture. Trinidad and Tobago became independent nation in 1962 and a republic in 1976. Officially Trinidadians or Tobagonians, people from Trinidad and Tobago the people are often informally referred to as Trinbagonians or Trinis. Unlike most of the English-speaking Caribbean, Trinidad and Tobago is a primarily industrialised country whose economy is based on petroleum and petrochemicals. Trinidad and Tobago is famous for its pre- Lenten Carnival and as the birthplace of steelpan, calypso and limbo. The capital city Port of Spain, is currently a leading candidate (along with Miami) to serve as the headquarters of the Permanent Secretariat of the Free Trade Area of the Americas (FTAA-ALCA). Both Trinidad and Tobago were originally settled by Amerindians of South American origin. Trinidad was first settled by pre-agricultural Archaic people at least 7,000 years ago, making it the earliest-settled part of the Caribbean. Ceramic-using agriculturalists settled Trinidad around 250 BCE and then moved further up the Lesser Antillean chain. At the time of European contact Trinidad was occupied by various Arawakan- and Cariban-speaking tribes including the Nepoya, Suppoya and Yao, while Tobago was occupied by the Island Caribs and Galibi. The Amerindian name for Trinidad was Kairi or Iere which is usually translated as The Land of the Hummingbird, although others have reported that it simply meant island. Christopher Columbus encountered the island of Trinidad on July 31, 1498 and named it after the Holy Trinity. Columbus reported seeing Tobago, which he named Bella Forma, but did not land on the island. The name Tobago is probably derived from tobacco. The Spanish established a presence in Trinidad, but due to a lack of settlers, eventually allowed any Roman Catholic European to settle on the island, leading to substantial immigration from France and elsewhere. Meanwhile, Tobago changed hands between British, French, Dutch and Courlanders. Britain consolidated its hold on both islands during the Napoleonic Wars, and they were combined into the colony of Trinidad and Tobago in 1899. As a result of these colonial struggles Amerindian, Spanish, French and English place names are all common in the country. African slaves and Chinese, Portuguese, Indian, and free African indentured labourers arrived to supply labour in the nineteenth and early twentieth century. Emigration from Barbados and the other Lesser Antilles, Venezuela, Syria, and Lebanon also impacted on the ethnic make-up of the country. The presence of American military bases in Chaguaramas and Cumuto in Trinidad during World War II profoundly changed the character of society. In the post-war period, the wave of decolonisation that swept the British Empire led to the formation of the West Indies Federation in 1958 as a vehicle for independence. Chaguaramas was the proposed site for the federal capital. The Federation dissolved after the withdrawal of Jamaica, and Trinidad and Tobago elected for independence in 1962. In 1990, 114 members of the Jamaat al Muslimeen, led by Yasin Abu Bakr, stormed the Red House (the seat of Parliament), and Trinidad and Tobago Television, the only television station in the country at the time, and held the country's government hostage for six days before surrendering (see Jamaat al Muslimeen coup attempt). Petroleum, petrochemicals and natural gas continue to be the backbone of the economy. Tourism is the mainstay of the economy of Tobago, and the island remains a favorite destination for many European tourists. Trinidad and Tobago is one of the most prosperous nations in the Caribbean, although less so than it was during the " oil boom" between 1973 and 1983. Recently, economic turmoil has caused an increase in violence and political instability. Trinidad and Tobago is a liberal democracy with a two-party system and a bicameral parliamentary system based on the Westminster System. The Head of State of Trinidad and Tobago is the President, currently Professor Emeritus George Maxwell Richards. The Head of Government is the Prime Minister. The President is elected by an Electoral College consisting of the full membership of both houses of Parliament. The Prime Minister is appointed by the President. The President is required to appoint the leader of the party who in his opinion has the most support of the members of the House of Representatives to this post; this has generally been the leader of the party which won the most seats in the previous election (except in the case of the 2001 General Elections). Since December 24, 2001, the governing party has been the People's National Movement led by Patrick Manning; the Opposition party is the United National Congress led by Kamla Persad-Bissessar ( Leader of the Opposition). Trinidad and Tobago is a leading member of the Caribbean Community (CARICOM) and the CARICOM Single Market and Economy (CSME). It is also the Seat of the Caribbean Court of Justice, which was inaugurated on 16th April 2005. Trinidad and Tobago are southeasterly islands of the Antilles or West Indies, situated between 10° 2' and 11° 12' N latitude and 60° 30' and 61° 56' W longitude. At the closest point, Trinidad is just 11 kilometres (7 miles) off the Venezuelan coast. Covering an area of 5,128 square kilometres (1,979 sq mi), the country consists of the two main islands, Trinidad and Tobago, and 21 smaller islands – including Chacachacare, Monos, Huevos, Gaspar Grande (or Gasparee), Little Tobago, and St. Giles Island. Trinidad is 4,768 square kilometres (1,841 sq mi) in area (comprising 93.0% of the country's total area) with an average length of 80 kilometres (50 mi) and an average width of 59 kilometres (37 mi). Tobago has an area of about 300 square kilometres (115 sq mi), or 5.8% of the country's area, is 41 kilometres (25.5 mi) long and 12 kilometres (7.5 mi) at its greatest width. The terrain of the islands is a mixture of mountains and plains. The highest point in the country is found on the Northern Range at El Cerro del Aripo which is situated at 940 metres (3,085 ft) above sea level. The climate is tropical. There are two seasons annually: the dry season for the first six months of the year, and the wet season in the second half of the year. Winds are predominantlly from the northeast and are dominated by the northeast trade winds. Unlike most of the other Caribbean islands, Trinidad and Tobago have frequently escaped the wrath of major devastating hurricanes including Hurricane Ivan, the most powerful storm to pass close to the islands in recent history in September 2004. As the majority of the population live in Trinidad, this is the location of most major towns and cities. There are three major municipalities in Trinidad: Port of Spain, the capital, San Fernando, and Chaguanas. Of these three, Chaguanas is the fastest growing. The largest town in Tobago is Scarborough. The Northern Range consists mainly of Upper Jurassic and Cretaceous rocks, mostly andesites and schists. The Northern Lowlands ( East-West Corridor and Caroni Plains) consist of Pleistocene or younger soft sands and clays with superficial gravel terraces and river and swamp alluvia. South of this, the Central Range is a folded anticlinal uplift consisting of Cretaceous and Eocene rocks, with Miocene formations along the southern and eastern flanks. The Naparima Plains and the Nariva Swamp form the southern shoulder of this uplift. The Southern Lowlands consist of Miocene and Pliocene sands, clays, and gravels. These overlie oil and natural gas deposits, especially north of the Los Bajos Fault. The Southern Range forms the third anticlinal uplift. It consists of several chains of hills, most famous being the Trinity Hills. The rocks consist of sandstones, shales and siltstones and clays formed in the Miocene and uplifted in the Pleistocene. Oil sands and mud volcanoes are especially common in this area. Although it is located just off-shore from South America, Trinidad and Tobago is often considered to be part of the North American continent by virtue of its being a Caribbean country. See Bicontinental countries. Trinidad and Tobago has earned a reputation as an excellent investment site for international businesses. A leading performer the past four years has been the booming natural gas sector. Tourism is a growing sector, although not proportionately as important as in many other Caribbean islands. The economy benefits from low inflation and a trade surplus. The year 2002 was marked by solid growth in the oil sector, offset in part by domestic political uncertainty. The three major banks are Republic Bank Limited, Royal Bank of Trinidad and Tobago Limited and First Citizens Bank. The 2002 to 2006 period has been marked with striking economic trends , high inflation fueled by massive government spending on construction programs and massive growth due to high oil prices. The total GDP has doubled during this period and now stands near 90 billion US dollars. It is feared that, high inflation and a bubble economy created by high oil prices may lead to a crash if the bubble were to burst, fall in oil prices or natural disaster. Of the country's 1.3 million inhabitants (as of 2005), most (96%) reside on the island of Trinidad with most of the remainder (4%) on Tobago. The ethnic composition of Trinidad and Tobago reflects a history of conquest and immigration. Two major ethnic groups - Indo-Trinidadians and Afro-Trinidadians - account for almost 80% of the population, while people of Mixed-race, Euro-Trinidadian/ European, Sino-Trinidadian/ Chinese and Arab-Trinidadian/Syrian-Lebanese descent make up most of the rest of the population. According to the 1990 census, Indo-Trinidadians make up 40.3% of the population, Afro-Trinidadians 39.5%, Mixed-race people 18.4%, Euro-Trinidadian 0.6% and Chinese, Syrians and others 1.2%. Euro-Trinidadians, especially those descendant of the former plantocracy, are often referred to as French Creoles, even if they are descended from Spanish, British, or German settlers. The mixed-race Cocoa Payols are descendant of the original Spanish settlers and later immigrants from Venezuela. The Trinidadian Portuguese population includes both whites and mixed people. The small Amerindian population is largely mixed-race. The Carib population, which is descendant of the indigenous inhabitants, is primarily organised around the Santa Rosa Carib Community. Emigration from Trinidad and Tobago, as with other Caribbean nations, has historically been high; most emigrants go to the United States, Canada and Britain. Emigration has continued, albeit at a lower rate, even as the birth rate sharply dropped to levels typical of industrialised countries. Largely because of this phenomenon, as of 2006, Trinidad and Tobago has the lowest population growth rate in the world (-0.87%). English is the country's only official language, but Bhojpuri, locally known as Hindi, is also spoken by a few Indo-Trinidadians and widely used in popular music such as chutney and chutney soca. The main spoken language, Trinidadian English is either classified as a dialect or variety of English or as an English Creole ( Trinidadian Creole English). The major spoken language in Tobago is Tobagonian Creole English. Both languages contain elements from a number and variety of African languages; Trinidadian English, however, is also largely influenced by French and French Creole and by Bhojpuri/Hindi. The creole languages and other vernaculars are normally spoken in informal situations, and there is not yet a formalized system of writing (other than as in standard English). Short-term visitors need not be concerned about learning Creole, as virtually everyone speaks English. Although Patois (a variety of French Creole) was once the most widely spoken language on the island (and also on the Venezuelan Paria coast), it is now rarely heard. Due to Trinidad's location on the coast of South America, the country has been slowly redeveloping a connection with the Spanish-speaking peoples, but has been impeded by the fact that in 2004, only 1,500 inhabitants spoke Spanish.2. ^ In 2004 the government initiated the Spanish as a First Foreign Language (SAFFL) initiative , with a public launch in March 2005. Government regulations now require Spanish to be taught to all beginning at the primary school level, while thirty percent of public employees are to be linguistically competent within five years. Venezuelans often come to Trinidad and Tobago to learn English, and many English schools have expanded to feature both English and Spanish. Many different religions are present in Trinidad and Tobago. The largest two are the Roman Catholics (26%) and Hindus (22%); the Anglicans (8%), Muslims (6%), Seventh-day Adventists (4%), Presbyterians and Methodists are among the smaller faiths. Two Afro-Caribbean syncretic faiths, the Shouter or Spiritual Baptists and the Orisha faith (formerly called Shangos, a less than complimentary term) are among the fastest growing religious groups, as are a host of American-style evangelical and fundamentalist churches usually lumped as " Pentecostal" by most Trinidadians (although this designation is often inaccurate). According to reports of Amnesty International, tortures and unfair trials are perpetrated in Trinidad and Tobago. There are several cases known of incorrect application of death penalty. The Cat o' nine tails is still used to flog prisoners - occasionally even women and boys under 16 - apparently in breech of the provisions of the "Corporal Punishment (Offenders over Sixteen) Act" of 1953. On 11 March, 2005 the Government of Trinidad & Tobago was ordered by the Inter-American Court of Human Rights to pay US$ 50,000 for "moral damages" to a prisoner who had received 15 strokes of the "Cat" plus expenses for his medical and psychological care. It is unclear whether the Court's decisions were met. Homosexuality is prohibited and punished with imprisonment; under Article 8 (18/1) of the Immigration Act, homosexuals are not allowed to enter the country. 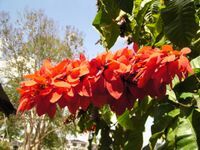 The Chaconia (Warszewiczia coccinea) flower is the national flower of Trinidad and Tobago. Trinidad and Tobago is famous for its pre- Lenten Carnival. It is also the birthplace of calypso music and the steelpan, which is widely claimed to be the only acoustic musical instrument invented during the 20th century. The diverse cultural and religious background allows for many festivities and ceremonies throughout the year. Other indigenous art forms include soca (a derivate of calypso), Parang (Venezuelan-influenced Christmas music), chutney, and pichakaree (musical forms which blend the music of the Caribbean and India) and the famous Limbo dance. The artistic scene is vibrant. Trinidad and Tobago claims two Nobel Prize-winning authors, V. S. Naipaul and St. Lucian-born Derek Walcott. Mas' designer Peter Minshall is renowned not only for his Carnival costumes, but also for his role in opening ceremonies of the Barcelona Olympics, the 1994 Football World Cup, the 1996 Summer Olympics and the 2002 Winter Olympics, for which he won an Emmy Award. Football: The national football team qualified for the 2006 FIFA World Cup by beating Bahrain in Manama on 16 November 2005, making them the smallest country ever (in terms of population) to qualify. This was their first successful qualification and brought their ranking to 51st in the World. The team, coached by Dutchman Leo Beenhakker, drew their first group game - against Sweden in Dortmund - 0-0, but lost the second game to England on late goals 0-2. Because Scotland did not qualify for the 2006 world cup, the Tartan Army supported Trinidad and Tobago and made their own song (primarily about player Jason Scotland) because they played England, Scotland's arch rival. They were eliminated after losing 2-0 to Paraguay in the last game of the Group Stage. Trinidad and Tobago was host to 2001 FIFA U-17 World Championship. Hasely Crawford won the first and only Olympic gold medal for Trinidad and Tobago in the men's 100 m dash in the 1976 Summer Olympics. Nine different athletes from Trinidad and Tobago have won twelve medals at the Olympics, beginning with a silver medal in weightlifting, won by Rodney Wilkes in 1948 , and most recently a bronze medal with by George Bovell III in 2004. Ato Boldon has won the most medals for Trinidad and Tobago with 4. The card-game All-Fours is sometimes described as the "Unofficial national sport". Variable Carnival Monday and Tuesday immediately preceding Ash Wednesday. Even though many businesses and schools close for Carnival Monday and Tuesday, they are not official public holidays. Variable Eid-ul-Fitr End of Ramadan. It is the only public holiday in Trinidad and Tobago that recognizes Islam. Even though it is not the most important holiday on the Islamic calendar it is the most widely and publicly celebrated Muslim holiday in the country. Variable Divali The Hindu festival of lights and the only holiday given in recognition of the Hindu faith.